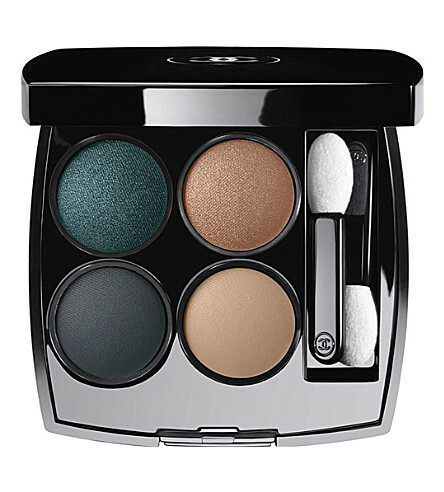 A palette of four eyeshadows that features the most advanced innovation to enhance creativity. Its optimised formula unites a soft texture and an easy application to achieve maximum colour that is consistent, luminous and lasts all day long. The shades come in a variety of effects: matte, satiny, iridescent or metallic. A practical and portable black lacquered case with a large mirror. Result: The four eyeshadows blend endlessly to define natural, intense, sophisticated or smoky eyes. A formula that enhances colour and makeup effects. An exceptional concentration of long-lasting pure pigments for a wider range of effects and intensities. A jellifying system and a blend of polymers and spherical powders for: a soft, creamy, glide-on texture shades that blend together perfectly for an even makeup result. Easy application and immediate intense coverage. Ophthalmologist tested and suitable for contact lens wearers.